This article is a work in progress & is going to be part of my informational services aimed at home energy evaluation & energy reduction. Standard incandescent bulbs currently used in your home or business have changed very little from Thomas Edison's first light bulb in 1879. Only about 10% or less of the energy used by incandescent bulbs becomes visible light; the other 90% is wasted as heat. Florescent bulbs are about 4 times more efficient than incandescent bulbs (florescent bulbs are at least 40-45% efficient) & can therefore save a lot of electricity costs, as well as operate cooler. In recent years many manufacturers have come out with a compact line of florescent bulbs with the ballast built in, which are designed to replace incandescent bulbs in screw based sockets. Prices for these screw based, compact florescent lamps (CFLs) have come way down & quality & practicality has gone way up, to the point where it is far more economical to use florescent bulbs than incandescent bulbs, once you take the electricity costs into account. Most people look at the price of a screw base, compact fluorescent lamp (CFLs) (usually $2. to $9. CDN each) & they choose the incandescent bulb which is often well under $1. but this is false economy. They fail to notice that florescent bulbs can last 3 to 13 times longer than incandescent bulbs AND that florescent bulbs only require 22 - 25% as much electricity for the same brightness. At the high prices of electricity these days, the huge savings when using florescent bulbs are primarily because of the reduced electricity requirements. For example, if your total cost of electricity in your area is $0.10 per kWh (kilo Watt hour) (including all the extras on your bill), then a 100 Watt incandescent bulb would use $100. worth of electricity over 10,000 hours (longest life of most florescent bulbs). Even if you used 6000 hours (the shortest rated life of any florescent bulb) as the comparison base, there would still be a $60. electricity cost for a 100 Watt incandescent bulb over 6000 hours. Since florescent bulbs only use about 25% of the electricity of an incandescent bulb, the above 100 Watt incandescent bulb if changed to a 25 Watt florescent bulb will save $45. to $75. in electricity costs over the life of that bulb. A 60 Watt incandescent bulb if changed to a 15 Watt florescent bulb will save $27. to $45. in electricity costs over the life of that bulb, depending on how many hours it's rated for & your kWh price for electricity. So it's not hard to see how the savings can add up for all the light bulbs in your house or business. Even if florescent bulbs are slightly more expensive to buy than incandescent bulbs based on a given number of hours, the cost is way more than made up by the enormous savings in electricity. Screw base, compact fluorescent lamps (CFLs) do still have some technical limitations but not many any more. Most models of CFLs do not work with dimmers, though some do, but those ones don't dim as low as an incandescent bulb. Florescent light packaging often has a disclaimer saying "May cause interference with radio, TV's, telephones, or remote controls. Not intended for use with emergency exit fixtures or emergency exit lights. Not for use with timers, photocells, dimmers and motion control devices." The manufacturer Luminus told me that their CFLs were designed to operate between 100 - 130 Volts & that they would burn out prematurely if the Voltage was below 100, but not cause a safety issue. Luminus also said that many but not all "electronic timers" & "electronic photocells" lower the Voltage too much, but that "mechanical timers" work fine with CFLs. If you have a Volt meter, measure the output of the electronic timer or photocell to see if it drops the Voltage too much for use on CFLs (normal Voltage is usually 117 VAC) & to see that it doesn't feed any Voltage to the CFL when it is off. Inexpensive inverters that create AC Voltage for household appliances from a battery are usually square wave AC (manufacturers call them modified sine wave) & this can cause a CFL to burn out prematurely, if you must use an inverter for a CFL, only use the more expensive full sine wave inverters. Many manufacturers of CFLs make their bulbs TOO TALL, so a 25 Watt CFL may not fit in a fixture that a 100 Watt incandescent came out of. It is unfortunate that more manufacturers don't find ways to make these bulbs fit the same height profile as the incandescent bulbs they are designed to replace, such as make the spiral wider so it doesn't have to be as tall. Some 14 Watt spiral shaped CFLs (Commercial Electric or Luminus brands) are as small as a 60 Watt incandescent bulb & fit almost anywhere. Incandescent bulbs are typically 3 7/8" - 4 1/4" or 9.9 - 10.7 CM tall. General Electric, Sylvania & Philips seem to have lagged behind in getting their CFLs down to the same size as an incandescent bulb. Most CFLs do not flicker or hum like models of several years ago & most now come on nearly instantly (within 1/2 second), though there are a few notable exceptions such as some models from Globe that take 1-2 seconds to turn on, which can sometimes be quite annoying if you're rushing into a room as you turn the light on. All CFLs are a bit dim when they first turn on, but most are up to full brightness within 1 minute. The ballast of CFLs typically use a switching frequency of about 40,000 Hz, so they do not cause headaches like the 60 Hz ballasts of 4' florescent ceiling fixtures. Color temperature of CFLs come in a range from 2600° Kelvin (very yellow warm) to 6500° Kelvin (slightly bluer than daylight). Personally I like CFLs in the mid range of 3500 to 4000° Kelvin. Incandescent bulbs are typically 2700 to 3000° Kelvin & daylight at noon on a sunny day is 5500° Kelvin. Most people have a sense that a higher color temperature (more bluish) might be better for reading. Some CFLs use 3 types of phosphors to give a better more even spectrum of lighting, or better Colour Rendering Index (CRI) . Most CFLs however, have a rather low CRI rating of about 80. Future improvements should be made in CFLs to bring them up to perhaps a 92 CRI index which renders colors much more accurately. CFLs are available to fit 3-way (trilite) fixtures (3 separate brightness levels), but they are sometimes expensive in Canada. In my opinion, CFLs have evolved to the point where they are usually identical in functionality to incandescent bulbs, last longer & they will continue to get smaller, better, more efficient, safer, better Color Rendering Index & less expensive. I would have presumed that screw base, compact fluorescent lamps (CFLs) were always safer than incandescent bulbs because they operate so much cooler, which should minimize the chance of combustible material igniting should it touch the bulb. However I received a report by a consumer who used a 14 Watt Luminus brand CFL purchased at Costco which went defective & started to smoke, here is what he said. "There was no actual flame, but it filled the globe (sealed light fixture) with very acrid smoke and then the smoke began to fill the hall. We were moving about in the hall at that particular moment and discovered the problem almost immediately. Whether the bulb will actually flame if left in a socket I don't know. It was powerful hot in that globe when I took it out and still actively belching smoke..." This was the potential first fire hazard incident I had heard of with CFLs, but it illustrates that a problem can occur. I have heard of fires caused by incandescent bulbs that were too high Wattage for the fixture they were installed in, or where they came in contact with combustible material (drapes, covers & lampshades, etc). 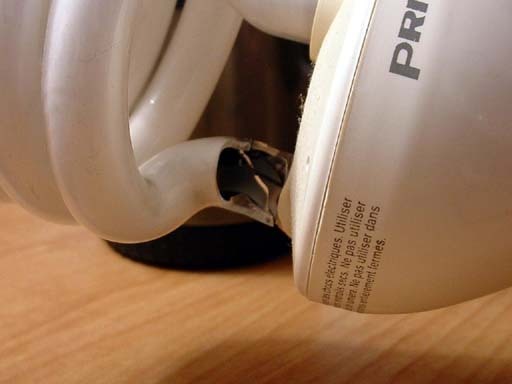 Besides problems with some Luminus brand CFLs, some Pricemark bulbs can be a hazard too. Note any bulbs listed below as having a safety hazard in red. CFLs that belch smoke, usually do so from the white base that contains electronic components (ballast). General Electric formerly had on their web site an explanation of "End Of Life" sensing protection that can prevent smoke, something all CFLs should incorporate. As a general rule, a CFL bulb that smokes does not catch fire because it is contained within the white ballast, but it sometimes scares consumers enough that they don't want to use CFLs. The Electrical Safety Authority has issued a warning about the way CFLs expire at the end of their life. The Ontario Fire Marshal's Office also looks into CFL safety. If you have the FCC ID number from the base of the CFL, you can go to the U.S. Federal Communications Commission site & often see pictures of the parts used on the inside of these CFLs. Another organization to complain to if you are a U.S. citizen & have a CFL safety issue is the U.S. Product Safety Commission . Some CFLs packaging indicates that the bulb contains mercury , which should be disposed of according to your locals laws, or call Lamp Recycle at 1-800-555-0050 or 1-800-435-4448. The mercury is contained in the sealed glass tube & presumably is not a safety hazard unless the glass gets broken (in which case don't breath near the tube). The amount of mercury is extremely small (5 mg or less, which would cover the head of a pin), but the bulb should not be disposed of with regular household garbage. Do CFLs pose a threat of mercury poisoning if they break? Some "Fieldbreeze" brand CFLs sold in dollar stores are not safety rated & are an extreme safety hazard. One model of Globe brand CFL has a UL stamp of safety approval, but UL says the bulb is NOT approved & is a potential safety hazard. If you have a CFL that you believe is a safety hazard & if it is CSA approved, send it to CSA Group , 178 Rexdale Blvd., Toronto Ontario, M9W 1R3 or Phone (416) 747-4277. All CFLs should have either the CSA (Canadian Standards Association) or UL or cUL (Underwriter's Labs ) logo of safety approval & if they do not have a safety rating as noted by the CSA or UL logo, then don't buy them. In Ontario & probably other Canadian provinces, ANY electrical device that operates on 32 Volts or more, must have either the CSA or UL logo, or be approved by the ESA (Electrical Safety Authority ) as long as there is a standard for the product (which there is for CFLs), presumably states in the U.S.A. have similar laws. It is assumed that CFLs can be put almost anywhere that an incandescent bulb can be put, but judging by the safety reports below, it is clear that some CFLs overheat & burn out early or cause potential safety issues when installed in a recessed or enclosed fixture. Read the manufacturers packaging for instructions of where & where not to use CFLs. Screw base, compact fluorescent lamps (CFLs) at a warm color temperature of about 2700° Kelvin have an advertised life of 6000 - 10,000 hours (250 - 417 days on constantly, or 4.7 - 7.8 years at 3.5 hours per day) which is substantially more than incandescent bulbs which are usually rated for 770 - 2000 hours (32-83 days on constantly, or 0.6 - 1.56 years at 3.5 hours per day). Having used CFLs for some time now,I am quite skeptical of some manufacturers claims for number of hours. Indeed, how would any typical consumer even know how long a bulb actually lasted unless they left it on constantly & took note of when they installed it & when it burned out. My own limited experience using at least 45 screw base compact fluorescent bulbs (as of 2003) in intermittent use (only occasionally turned on) in the last 18 months, is that 5 of them have burned out way too early (that's at least a 11.1% early failure rate using this small sampling & is likely to be higher). One person has reported to me that 19 of 21 Luminus 20 Watt CFLs purchased at Costco have burned out significantly prematurely. Another reported most 14 Watt Luminus CFLs burned out prematurely. At least one manufacturer has tried to convince me that less than 1% of CFLs fail prematurely, but I don't believe it, so keep your bill so you can return any bulb that burns our prematurely. In particular I've found that Sylvania brand CFLs routinely don't last very long. I've heard one report of Pur-lite bulbs burning out in a month or two. I received a report on poor customer service regarding Globe Electric Co. I have observed that using a florescent bulb in a pull chain fixture might shorten their life, possible because of the vibration. CFLs used in totally enclosed fixtures or florescent floods will also result in shortened life, probably because of heat build up in the sealed fixture. Bulbs routinely turned on in sub freezing temperatures (below -23°C or -10°F) may also shorten bulb life expectancy. Even if the manufacturers claims of life expectancy for CFLs is only half of what they claim, I still feel they are excellent value because of the huge cost in electricity they save. Light output is measured in lumens , but it is generally assumed that you will get approximately the same output of an incandescent bulb if you use a CFL bulb of 25% the Wattage. For example, if you found that you needed a 100 Watt incandescent bulb to provide enough light, then use a 23-27 Watt CFL to do the same job (if it fits in the fixture). If you were using a 60 Watt incandescent bulb, then switch it to a 13-15 Watt CFL for similar light output. The rated light output of some CFLs is based on the bulb being upside down (i.e. screw base at top), but sometimes in a sealed fixture that actually decreases the life of the bulb because heat rises to the ballast area causing over heating. If the screw base is at the bottom, the light output may be as low as 92 - 95% of rated brightness (I have not verified this). At a given light output, CFLs create a lot less heat than incandescent bulbs which is a bonus. Florescent flood lights that shine in only one direction tend to be a little less efficient compared to CFLs that shine in all directions, because floods are forced to reflect the light in one direction which isn't as efficient use of the light. So which brands of CFLs seem to be generally better than others? Read below & you will see many specifics listed, but so far Philips brand is the only brand I have listed here that I have not received a potential safety hazard report for. Phillips being 1 of the big three domestic manufacturers, has some interesting CFLs. I formerly had a personal preference for the Commercial Electric brand (sold at Home Depot) (made by Technical Consumer Products Inc.) because their designs seem well thought out, they work very well, but I have since received several bad reports. Essentially similar CFLs to Commercial Electric may also sell under other brand names like N:Vision & DuraBright. Globe brand CFLs often seem unrefined, turn on slowly & are too tall, but otherwise seem to function ok. The 13 Watt Globe brand bulb listed below says it is UL safety rated, but in fact it isn't. I would avoid buying Globe brand CFLs when they violate UL standards. Luminus brand CFLs are a mixed bag, with some earlier models failing prematurely & some models being a definite safety hazard, so I would avoid this brand. Luminus seems to be one of those companies who does their product testing on the public rather than in the lab before they release the product to the public. Rona Hardware stores is a brand I have limited experience with. Sylvania being another of the big three domestic manufacturers seems to have it's share of premature burn outs & several possible safety hazard reports, so I would stay away from this brand. Pricemark brand of CFLs present a possible safety hazard, sometimes burn out prematurely & show no advanced characteristics. Pur-lite brand CFLs are a definite safety hazard & don't seem to be stocked by Canadian Tires stores any more & they have non standard descriptions of product (color temperature levels ), sometimes flicker when off, no web presence & only have a 1 year guarantee for a bulb that's supposed to last up to 7 years. Light of America brand of CFLs seems unremarkable, with premature burn outs reported, possible safety hazards & CFLs that are too tall. General Electric being the other of the big three domestic manufacturers but I have little experience with this brand so far. GE is the only brand I could find that formerly described on their web site an "End Of Life" sensing safety protection, that shows they care about their customer's safety & about proper research. "Fieldbreeze" brand of CFLs can be an extreme safety hazard & has no safety rating (CSA or UL) & uses flammable plastic, under no circumstances should you buy this brand if you value your life & your house. IKEA I only have 2 reports on this brand & it mentions a potential safety hazard. NOMA is a CFL brand now selling in my area, but I haven't tried them yet. Note any bulbs listed below as having a safety hazard in red. Below are some brands & models I've bought along with comments from other users. Philips 9 Watts Vanity GLOBE shaped. Rated for 8,000 hours or 7years (3.1 hours per day), 500 lumens. Operating range -30°C to 60°C (-22°F to 140°F). 4 3/8" or 11.1 CM tall from tip to base. Made in China. cUL certified. Comes on dim, but brightens within a couple minutes. Philips Marathon 11 Watts SPIRAL shaped. Rated for 8,000 hours or 6 years (3 hours per day), 674 lumens. Operating range -20°C to 60°C (-4°F to 140°F). 4 1/4" or 10.8 CM tall from tip to base. Made in China. UL & CSA certified. Philips Marathon 15 Watts SPIRAL shaped. Rated for 10,000 hours or 7 years warranty (3 hours a day), 860 lumens, 2700 °K (yellow warm color) & 82 CRI (Color Rendering Index). Operating range -20°C to 60°C (-4°F to 140°F). 4 13/16" or 12.3 CM which is rather tall. Comes on instantly. Made in China. cUL & CSA certified. Philips shaped like a NORMAL bulb in 2 sizes (smaller one almost same shape as an incandescent bulb & 5 3/8" or 13.7 CM tall) 16 Watt = 60 Watt, 6,000 hours, 5 years based on 3.3 hours per day, actually uses 15 Watts, 825 lumens, manufacturer says color temperature 2700°K & that's exactly what I measured, 82 CRI, $14.99 CDN for one bulb & more recently about $7. CDN for other (smaller bulb), good to -10°F or -23°C (newer version says -25°F or -45°C) because of it's sealed outer bulb (not good for putting in a sealed fixture), made in Poland, head office New Jersey. Might not make proper electrical contact with the base of all sockets because of wide ballast & slightly stubbier screw base. Bulb comes on rather dim, but eventually brightens up. Good for when you have a lamp shade clipping directly on the bulb. Bulb is CSA & UL certified. Philips is 25 Watts & has 3 U shaped stems. Made in Mexico. Measured 2800° Kelvin. 6 1/8" tall (15.6 CM). Inside of tube tends to darken with age. Is UL & CSA certified. Philips Marathon 27 Watts SPIRAL shaped. Rated for 10,000 hours or 7 years (3.1 hours a day) guaranteed, 1620 lumens. Operating range -20°C to 60°C (-4°F to 140°F), rather tall. Made in China. cUL & CSA certified. Slightly bluer than daylight at 6500°K with an 80 CRI (Color Rendering Index). Philips SLS15 15 Watts 3U shaped. Made in Mexico. Customer comments. Commercial Electric 14 Watt SPIRAL (measured 13 Watts) rated for 10,000 hours, 7 years based on 3.9 hours per day & the packaging actually says "This product is under warranty for 7 years". Rated at 900 lumens which might be slightly over rated because it is not as bright as the 13 Watt Luminus spiral. Strength is that this bulb is very small (4 5/16" or 11.0 CM tip to base) so it can fit anywhere that a conventional incandescent bulb would fit. Turns on more instantly than most florescent bulbs & has a minimum starting temperature of -20°F (-29°C). Color temperature measured 2800° Kelvin. $19.98 CDN at Home Depot for 4 bulbs. Bulb is not CSA certified, but is UL certified. Made in China. Commercial Electric 14 Watt FLOOD (measured 13 Watts) (indoor/outdoor) with fogged glass face, sold by Home Depot for $20. CDN for two. Rated for 6000 hours (5 years based on 3.3 hours per day), may have overestimated light output saying 14 Watt = 65 Watt. Outdoor temp minimum -20°F (-29°C). Strength is that this bulb is suitable for use in wet outdoor locations, rated at 640 lumens (I'd guess that light output is over rated). This bulb takes 1-2 seconds to turn on which can be annoying & it takes awhile to come up to full brightness. Color temperature measured 2600° Kelvin (yellow warm color). Bulb is not CSA certified, but is UL certified. Of 6 Commercial Electric Flood bulbs I bought, 1 burned out very prematurely. The competitor Luminus floods (145454 & 145453) appear to be brighter bulbs, at a lower cost & rated for more hours, but they're not for wet locations. Made in China. Commercial Electric 23 Watt SPIRAL (measured 19 Watts after warming up for a few minutes) SKU # 415-413 & 358-875, models EDXO-23 & C8PESL23TM, rated for 10,000 hours, 7 years based on 3.9 hours per day & the packaging actually says "This product is under warranty for 7 years". Rated at 1600 lumens although it probably is less because it burned at a significantly lower Wattage than rated. Warm white light. Strength is that this bulb is very short especial in it's brighter class range (4 11/16" or 11.8 CM tip to base) so it can fit almost anywhere that a conventional incandescent bulb would fit. Turns on more instantly than most florescent bulbs & has a minimum starting temperature of -20°F (-29°C). $17.99 CDN at Home Depot for 3 bulbs. Bulb is not CSA certified, but is UL certified. Made in China. Potential safety hazard comments & picture. Commercial Electric 42 Watt SPIRAL advertising claims similar in brightness to a 150 Watt incandescent bulb (measured 35 Watts when first turned on & rises to about 36 or 37 Watts after warming up for a few minutes) Rated at 2600 lumens, but since Wattage isn't what is claimed, brightness might not be what's claimed either. SKU # 167-190, rated for 10,000 hours, 7 years based on 3.9 hours per day & the packaging actually says "Guaranteed, based on average of 4 hours per day". Warm white light. Bulb is quite tall, so it comes with harp extensions. Turns on more instantly than most florescent bulbs & has a minimum starting temperature of -20°F (-29°C). About $12.95 CDN at Home Depot for 1 bulb. Bulb is not CSA certified, but is UL certified. Made in China. Luminus (Imported by Conglom Inc.)(item 867867) 13 Watt SPIRAL super bright Micro T2, 3 11/16" or 95 CM ultra compact sized to fit in almost any fixture, 900 lumens, color temperature 2700° Kelvin (yellow warm color), rated for 10,000 hours up to 9 years, warranty for 3 years, operates down to -23°C or -10°F, cUL approved, made in China. $14.79 for 8 bulbs at Costco Nov. 2007. Comes with a nice reusable case that protects the bulbs. Luminus (item 145456)(new ultra bright mini spiral, also called professional series) 13 Watt SPIRAL shaped but not as short as above model (this model is 9/16" taller & is 4 15/16" or 12.5 CM base to tip), rated for 10,000 hours, lasts up to 7 years based on 3-4 hours per day (actual 3.91 hours per day if you do the math) although it only has a 3 year limited warranty, 900 lumens (it is quite bright for 13 Watts), Luminus claims this model is more efficient than their 145457 model & I believe that claim (this bulb is 78% less electricity than a 60 Watt incandescent bulb). Suitable for indoor or outdoor (outdoor must be dry), $15.69 CDN for 3 bulbs at Costco ($4. off Aug. 4-17/2003). Starts below -23°C (-10°F). Manufacturer says colour temperature 2700° Kelvin (yellow warm color), I measured 2800°K. This model might be safer than the 145457 model because it clearly is a different design. Strength is that it starts instantly & brightly. Might be too tall for some fixtures. Bulb is not CSA certified, but is UL certified. Customer comments. Luminus (item 865983)(P17713 DH08) Super Bright Ultra Mini SPIRAL 13 Watts. 4 1/16" or 10.3 CM base to tip (nice & short). Rated for 10,000 hours, lasts up to 9 years (at 3.04 hours per day) warranty for 3 years from date of purchase. Light output 900 lumens, 2700° Kelvin (yellow warm color). Suitable for outdoor use in dry location (down to -23°C or -10°F) (will start at temperatures below this but may affect lamp life). Bulb cUL certified, but not CSA certified. Of 8 bulbs in package, 1 failed shortly after installation. There are two versions of this bulb with the same item number but slightly different shape. The newest one is slightly taller 4 3/16" (10.7 cm) & has a much smaller ballast (1.5" diameter) that says P-17713T. Luminus (item 145457) 14 Watt SPIRAL shaped (measures 13 Watts), rated for 9000 hours (don't believe it), 6 years based on 3-4 hours per day (actual 4.1 hours per day if you do the math), 800 lumens, Luminus says 14 Watts is equal to 60 Watts, suitable for indoor or outdoor (outdoor must be dry), $18.79 CDN for 3 bulbs at Costco in 2002 & 2003. Luminus claims their energy efficient CFLs convert about 50% of the electricity used into light (it's probably more like 40-45%). I had one burn out very prematurely, out of about 15 & other people have reported significantly higher failure rates. This is a nice spiral shaped bulb that is exactly the same size as some of the larger incandescent bulbs (4 3/8" or 11.2 CM base to tip). Starts instantly. Color temperature measured 2700° Kelvin (yellow warm color). Initially I liked this model because of it's small length which fits anywhere an incandescent bulb would fit & instant start, but it might be a fire hazard. Costco stopped carrying this model in the spring of 2003 & now carries the 13 Watt model below. This 14 Watt CFL is CSA certified, but not UL certified. I have had one safety hazard report from another user of this bulb that after 1-2 years of use, the built in ballast started to burn up & smoke causing a possible fire hazard. CSA is looking into a possible recall of this bulb. The numbers listed on the defective bulb are as follows: FCC ID: OTZ-91535 CSA-206256 2814-DO2 Customer comments. Luminus (item 145454) 14 Watt FLOOD (actually measures 13 Watts) with clear front & highly polished reflector inside & out, with a 3 stem inner bulb. Turns on more instantly that competitor (Commercial Electric) & might be slightly brighter, but is slow to get bright. Rated for 8,000 hours at 530 lumens. Can be used outdoors (down to -23°C or -10°F) in dry locations (Commercial Electric flood can be used in wet locations). $15.99 CDN for two at Costco. Color temperature measured 2800° Kelvin. They probably overestimate Wattage equivalent by saying 14 Watt = 65 Watt requiring 78% less electricity than incandescent floods. Low manufacturers estimate of 5 years based on 3-4 hours per day (actual math if bulb last 8000 hours is 4.38 hours per day). Value & functionality of this bulb initially seem very good. Bulb is CSA certified, but not UL certified. I have had one safety hazard report from another user of this bulb that said, "We just built a new home and installed 12 of the 14w flood bulbs indoors (item 145454). We have lived in the house for a month now. We have had to replace 3 bulbs. They all cracked at the base and the reflector glass broke and a piece actually fell off onto the floor which is very dangerous as we have a 9 month old. These bulbs burned for maybe 3-5 hours a day for a month. The one bulb we put in to replace the one where the glass fell on the floor lasted for 10 minutes before it cracked. It still works but we are afraid of glass falling again." I examined the unused bulb I still had in the package & also found that the glass reflector was cracked (very thin glass near base). I have asked CSA to consider a recall of this bulb. I now see that Costco is selling a substitute (see item number 145453 below), so maybe the defective version is already off the shelves. Customer comments. Luminus (item 145453) 15 Watt FLOOD (actually measures 16 Watts) with clear front & highly polished reflector inside & out with a 4 stem u shaped inner bulb. Although this is a flood bulb, light is not evenly distributed, there is a bright spot in middle. Turns on more instantly that competitor (Commercial Electric) & is brighter, but is slow to get bright from a cold start. Rated for 8,000 hours at 600 lumens (noticeably brighter than 14 Watt bulb above). Can be used outdoors (down to -23°C or -10°F) in dry locations (Commercial Electric flood can be used in wet locations). $15.99 CDN for two floods at Costco. Low manufacturers estimate of 5 years based on 3-4 hours per day (actual math if bulb last 8000 hours is 4.38 hours per day). Value & functionality of this bulb initially seems very good. Bulb is CSA certified, but not UL certified. I've experienced 1 new bulb that simply didn't work at all. Customer comments. Luminus (item 145464) 15 Watt FLOOD with flogged front glass reflector & a spiral inner bulb. Rated for 8,000 hours at 725 lumens. Suitable for outdoor use in dry location (down to -23°C or -10°F) (will start at temperatures below this but may affect lamp life). Manufacturer claims bulb can last up to 7 years (at 3.13 hours per day) & is warranty for 3 years from date of purchase. Bulb cUL certified, but not CSA certified. Luminus 23 Watt SPIRAL I haven't used this bulb myself, but I received the following safety hazard warning from another user "This light bulb started to smell really badly and we feared it may flame out. The model is 4001-F04." Customer comments. Luminus (item 145458) 25 Watt SPIRAL shaped (actually 23 Watts) rated for 10,000 hours, 7 years based on 3.9 hours per day, 1600 lumens, quite tall (6 3/16" or 15.7 CM base to tip) (too tall for some fixtures). $20. CDN for 3 bulbs at Costco. Ok for outdoor use in dry location. Color temperature measured 2600° Kelvin (yellow warm color). Bulb is CSA certified, but not UL certified. Customer comments. General Electric FLE10HT3/2/SW 10 Watts SPIRAL, soft white, 520 lumens, 8,000 hours, 4 5/16" or 11 CM tip to base in height, guaranteed to last 5 years at 4 hours per day. Reliable cold starting down to 5°F (-15°C). UL certified. Made in China. $8.96 CDN for 3 bulbs in Wal-Mart. General Electric FLE13HT3/2/SW 13 Watts SPIRAL, soft white, 825 lumens, 8,000 hours, 4 13/16" or 12.2 CM tip to base in height, guaranteed to last 5 years at 4 hours per day. Reliable cold starting down to 5°F (-15°C). UL certified. Made in China. General Electric made in Hungary, 15 Watts = 60 Watts ELONGATED CANDLE shaped, 850 lumens, 12,000 hours, cool blue daylight color of 6500° Kelvin (slightly bluer than daylight), $21.99 CDN at Canadian Tire for one bulb. I have not actually tried this one, but listed it because of it's unusual blue colour temperature, which might be handy for some lighting situations. General Electric made in Hungary, 15 Watts STEM shaped, Biax, 250 mA FLE15DBX/SPX27, UL code. FCC ID: BLD3431. I haven't used this model, but received the following potential safety hazard comments & picture. General Electric made in Hungary, 20 Watts, Biax, FCC ID: BLD 20 HLT. I haven't used this model, but received the following potential safety hazard comments. General Electric FLE26HT3/2/SW 26 Watts SPIRAL, soft white, 1700 lumens, 8,000 hours, 5 1/16" or 13 CM tip to base height, guaranteed to last 5 years at 4 hours per day. Reliable cold starting down to 5°F (-15°C). UL certified. Made in China. $8.96 CDN for 2 bulbs in Wal-Mart. Globe Electric Company Inc. 11 Watts double STEM shaped, very tall 5 15/16" or 15.1 CM (too tall for many fixtures). Purchased at Wal-Mart for $6.48. CDN 660 lumens, 6000 hours, 5 years based on 3.3 hours per day. Color temperature measured 2800° Kelvin. Bulb is not CSA certified, but is UL certified. Globe Electric Company Inc. (#27514) 13 Watts = 60 Watts, SPIRAL but not quite as small as an incandescent bulb or the competition (Luminus & Commercial Electric). This bulb is 5" or 12.6 CM base to tip. 10,000 hours (7 years based on average of 3.9 hours per day), 780 lumens. Made in China by the Fujian Joinluck Electronic Enterprise Co. Ltd. I found this bulb annoying in that it takes almost 2 seconds to turn on. Two bulbs for $9.96 CDN at Wal-Mart. I would recommend the Commercial Electric 14 Watt bulb over this model. Bulb is not CSA certified, but says it is UL certified (E197131). Note that this CFL from Globe Electric has been found by Underwriters Laboratories to not conform to their standards authorized by the UL logo mark, due to a production error that occurred in manufacturing which used a non-compliant internal component. UL says this bulb "may pose a potential fire and electric shock hazard ." The Electrical Safety Authority has had a recall too. As does the Ontario Fire Marshal's Office . Several users of this CFL sent me pictures & made comments about this CFL. If you have any of these bulbs in service, take them back to the store you bought them at for a refund or exchange, or contact Globe Electric at customerservice@globe-electric.com or phone (514) 694-0444 (ext 151)(Montreal Canada) for a 2 for 1 replacement. Globe Electric Company Inc. 23 Watt = 60 Watt, SPIRAL pictures & comments. Globe Electric Company Inc. (#08303) 25 Watt = 100 Watts, SPIRAL but very tall (6" or 15.2 CM base to tip)(too tall for many fixtures), 10,000 hours (7 years based on average of 3.9 hours per day), 1500 lumens. Color temperature 2700°K, CRI 82, made in China. Bulb is not CSA certified, but is UL certified. Sylvania CF13EL/SuperMini is a 13 Watt SPIRAL (measures 12 Watts), 3500°K (Sylvania calls it "Daylight Extra") which is actually nowhere near daylight color but a nice in between color that is not too yellow or too blue. 8000 hours (based on 3 hours per day), 7 years, 850 lumens, 0°F (-18°C) to 100°F (40°C), made in China, 4 3/16" or 11.7 CM tall, some bulbs flicker when first turned on & cause electronic interference, cUL approved, does not have vent holes in ballast base like model below, 2 bulbs for $5.99 Nov. 2007. Sylvania CF13EL/MiniTwist is a 13 Watt SPIRAL. 3000°K. cUL approved, has vent holes in ballast base. I did not try this bulb but received the following safety hazard warnings with comments & pictures from other users. Sylvania Deluxe EL13W 13 Watt double STEM type, burned out after 6 months of very light duty use in vestibule enclosed fixture. 5 1/2" or 14.0 CM tall, may not fit in some fixtures. Bulb is CSA & UL certified. Sylvania SRS-13W is a 13 Watt SPIRAL. I did not try this bulb, but received the following comments about it. "We've had four SRS-13W Mini Spirals fail after brief (one month or less) use. The last one became very hot near one end of the coil. The first time I advised Sylvania they sent replacements. Now that its happened again with the replacements I'm not sure if I want Sylvania products." Sylvania Deluxe EL20W 20 Watt triple STEM type, burned out probably prematurely. 6 3/16" or 15.6 CM tall. CSA & UL certified. A comment from another user of this bulb made the follow possible safety hazard warning "Sylvania EL20W lamp overheat at one end of the tube, resulting in some melting of plastic and a little smoke. I caught it quickly, so I don't know whether or not it would have become more serious." Another comment "One of the bulbs started smoking at the base. It is a Sylvania CF 20EL/830 model bulb. David"
Sylvania Deluxe EL23W 23 Watt triple STEM type, bulb burned out in a few months when on a pull chain. 6 7/8" or 17.4 CM tall, won't fit in many fixtures. Bulb is CSA & UL certified. Sylvania (Osram) CF30EL is a 30 Watt SPIRAL. Is 4 7/8" or 12.4 CM tall which is nice & compact for such a bright light (claims to be 14% brighter than a 100 Watt incandescent bulb). Bulb is UL approved. Claims to be 2000 lumens in brightness at 3000° Kelvin. Life claim 6000 hours or 5 years warranty (3.3 hours per day). Made in China. Pricemark (imported by OSL of Mississauga L5S 1S4) & manufactured by Chuan Shih Industrial Co. Ltd. , in CHUAN HUA, Taiwan. 20 Watt spiral but tall 5 3/16" or 13.2 CM (too large for some fixtures), red box bought at Home Depot I think for about $7., 10,000 hours, color temperature 3000°K. Bulb is not CSA certified, but is UL certified. This bulb burned out (stopped working) long before (several hundred hours) it's rated number of hours (10,000). Pricemark bulbs can be a safety hazard Here are pictures & comments from another user. Pricemark (imported by OSL of Mississauga L5S 1S4) & manufactured by Chuan Shih Industrial Co. Ltd. , in CHUAN HUA, Taiwan. 23 Watt = 90 Watt, SPIRAL but tall 5 7/8" or 14.9 CM (too large for some fixtures), red box bought at Home Depot I think for about $7., 10,000 hours, manufacturer says color temperature is 3000°K but I measured 2700 Kelvin, ballast turns yellow with heat after awhile. Bulb is not CSA certified, but is UL certified. I had one burn out prematurely. Pricemark bulbs can be a safety hazard Here is what a Pricemark bulb looks like when it's gone up in smoke . Here are pictures & comments from another user. Pur-lite by Pro-Image (TM) by Reusable Technology Inc. (USA) made in China. This is a 3-way (trilite) SPIRAL 20/11/26 Watt bulb for trilite fixtures purchased at Canadian Tire on sale for $21.99 CDN for a package of two (Pro-3000) ($11. per bulb) (regular price $24.99 CDN for 2). The manufacturer says the 20 Watts = 75 Watts incandescent or 1250 lumens (but it really uses 18 Watts), the 11 Watts = 50 Watts incandescent or 660 lumens (it really does use 11 Watts), the 26 Watts = 105 Watts incandescent or 1700 lumens (but it really uses 22 Watts & is less bright than claimed at the brightest setting). There is very little difference in brightness between the 20 & 26 Watt settings, probably because they are really 18 & 22 Watts. Note that unlike tradition 3-way (trilite) bulbs that have low/medium/high order settings, this one orders them medium/low/high, which I don't like as much. The package unfortunately comes with two bulbs each with a quite different colour temperature, so if you are buying bulbs for a pair of trilite fixtures in your bedroom or living room & you want the colour temperatures to match, you will have to buy two sets. The packaging says that one bulb is called "soft white" (model SS3-105-15) (with the silver coloured screw base) & is about 3000° Kelvin or about the same warm colour as a normal incandescent bulb (my measurement said 2900° Kelvin) & the other bulb they call "brite white" (model SU3-105-16) (gold coloured screw base) is more bluish/white & my measurement was 4000° Kelvin or what some florescent tube manufacturers might call "daylight" colour, although daylight color is actually 5600° Kelvin. The manufacturer claims this colour temperature of 4000° Kelvin (they call it "clear color technology") is better for reading & hobbies (I have my doubts). It's unfortunate that when colour coding the bulb base, the manufacturer didn't make the warmer "soft white" bulb use the warmer gold colour base. The bulbs are 5 3/4" or 14.6 CM tall which is taller than the incandescent 3-way bulb it replaces, but not nearly as tall as the Lights Of America 3-way bulb. You may have to buy a 1" taller harp for your fixture before this bulb will fit. I found that occasionally this bulb flickered dimly for some time after it was turned off & I've had 3 other people report similar flickering of Pur-lite bulbs after they are turned off. The bulb is UL certified but not CSA certified & manufacturer claims that it has an average life expectancy of 10,000 hours or 7 years if used 3.9 hours each day, but only warranties it for 1 year. I found that the soft white bulb burned out after 8 months of use at no more than 10 minutes use per day. Furthermore, while the bulb showed no visible signs of burning, the base was extremely hot after it had burned out, which I consider to be a safety hazard. Pur-lite by Pro-Image (TM) by Reusable Technology Inc. (USA) made in China. This is a 15 Watt SPIRAL bulb purchased at Canadian Tire on sale for $14.99 CDN for a package of four (Pro-9000X) ($3.75 CDN per bulb) (regular price $17.99 CDN for 4). The bulbs are a mixture of two different colour temperatures of 2900°& 4000° Kelvin (see description above for 3-way bulb). The bulb is UL certified but not CSA certified & manufacturer claims that it has an average life expectancy of 10,000 hours or 7 years if used 3.9 hours each day, but only warranties it for 1 year. I have not personally bought & tried this model bulb, but others have provided user comments including pictures of a possible safety hazard for model SSX-070-00. I've had 3 other people report flickering of Pur-lite bulbs after they are turned off. Lights Of America model 2213 LPF (328) 13 Watt FLOOD. I haven't used this bulb myself, but received the following safety hazard warning from another user & a picture. Lights Of America model 2215-2VP, purchased in USA 15 Watt 4 U shaped STEMS which are taller than a standard incandescent bulb (this bulb is 5 1/16" or 12.8 CM base to tip) which may be too tall for some fixtures, good to -20°F (-29°C), 820 Lumens, 8000 hours, 6 year (based on 3.65 hours per day). Color temperature measured 2800° Kelvin. Bulb is CSA & UL certified. Lights Of America model 2425-2VP, purchased in USA & says "made in U.S.A." California, 25 Watt SPIRAL bulb but very tall (5.75" or 14.7 CM base to tip)(won't fit in some fixtures), 1,600 lumens, 10,000 hours, 7 year bulb (based on average 3.9 hours per day). Color temperature measured 2600° Kelvin. Bulb is CSA certified, but not UL certified. I received the following safety hazard warnings & comments from other users. Lights Of America model 2433, purchased in USA at Wal-Mart for $9.58 U.S. (about $13.80 CDN). 3 way (tri-lite) 13/23/32 Watt SPIRAL bulb for trilight fixtures. 13 Watts = 50 Watts incandescent or 800 lumens, 23 Watts = 100 Watts incandescent or 1450 lumens, 32 Watts = 150 Watts incandescent or 2600 lumens. 10,000 hours, made in the U.S.A. Minimum starting temperature 20° F or -7°C. Unfortunately this bulb was so extremely tall (6 7/8" or 17.5 CM) that it would not fit in the fixture without buying a 2" taller harp for the fixture. The incandescent 50/100/150 bulb that was in the fixture was 5" (12.7 CM) tall. Bulb is CSA certified, but not UL certified. Unfortunately this bulb stopped functioning less than 1 hour after installation. Lights Of America model 2424, 25/60 Watts. I haven't used this bulb myself, but received the following safety hazard warning "We had two in one lamp...each 25w/60w. Their number was 2425 and they are both UL/CSA. Last night one of the bulbs started smoking really bad...gave off a horrible odour...smelled like a strong "skunk" smell. We caught it before a fire started, but the plastic base of the bulb had melted and the glass turned black. The other bulb in that lamp looks as though it will do the same thing soon...dark black where the glass meets the base. VERY SCARY! We can't figure out if these are bad bulbs or if it has something to do with the lamp. The lamp can take up to 60w in each socket. IKEA 20 Watts I did not try this bulb but received the following safety hazard warning from another user. "Recently an IKEA 20 watt bulb burned out, got very hot, and started smoking (open recessed cans). I was worried about a fire hazard too. It only smoked and got very hot--I was concerned what might have happened if I hadn't seen it. Mark from Baltimore. Feit Electric (Conserv-Energy, phone 1866-326-BULB) model CE18TM/D/6 (Costco U.S. item #238653 $9.99 for 6 bulbs Oct. 2010) 18 Watt SPIRAL (= to 75 Watts incandescent). Colour temperature is 5800°K (another part of box says 6500°K daylight which is rather bluish). Rated for 8,000 hours at 1170 lumens. Two year warranty. Operating range -23°C to 60°C (-10°F to 140°F). Height 4 5/8" or 11.7 CM which is rather tall. Comes on instantly. Made in China. Bulb is cULus certified. Uses lower amounts of mercury & lead than European RoHS (Reduction of Hazardous Substances) & ENERGY STAR standards. First published May 3/2003, last updated November 9/2007.